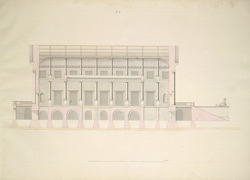 Pen-and-ink and water-colour drawing of a longitudinal section of Government House, Chennai (formerly known as Madras) by John Goldingham (1767-1844) in 1803. This is one of 16 drawings of plans, elevations, and sections of Government House and its adjoining buildings made under the supervision of John Goldingham, Civil Engineer, Madras. 1803. These drawings were copies made for Lord Clive Governor of Madras, 1798-1803 (later 1st Earl of Powis). Chennai, situated on the Bay of Bengal in the north-east corner of Tamil Nadu, was the first important settlement of the East India Company; the city was founded in 1639. Government House was originally the property of the wealthy Mrs. Antonia de Madeiros, after whose family many think Madras is named. She sold the property to the East India Company in 1753 when it became home of the Governors of Madras from the time of Thomas Saunders until Independence in 1947. The house was considerably expanded under Lord Edward Clive, Governor of Madras between 1798 and 1803 to the designs of John Goldingham, a Danish mathematician. The additions included a grand two-storey classical façade with deep verandahs and irregular colonnades. Goldsmith also built the adjoining Banqueting Hall (now Rajaji Hall). An additional storey was added to Government House in 1860 and a huge verandah in 1895.